Dinosaurs — or at least their bones — were roaming the halls of the Cleburne Conference Center on Thursday. 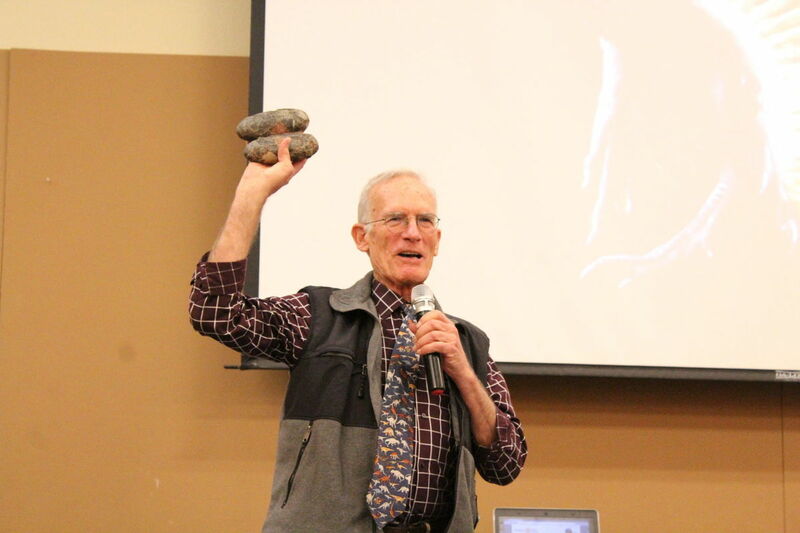 Southwestern Adventist University biological sciences professor Arthur “Art” Chadwick spoke to Cleburne Rotary Club members about the university’s dinosaur museum and how they use 21st century technology and innovation to research dinosaur bones during its weekly luncheon. Using the scientific approach, he encourages scientists to use multiple hypotheses. When it comes to questioning how dinosaurs left this world, he said scientists have many hypotheses, including: dying from meteorites, the climate was too hot, too cold, too dry, too wet or dinosaurs had too little food, too much food, poisonous food or died of constipation. Some say they even died from volcanic eruptions, he said. Through research he’s conducted, he’s concluded dinosaurs drowned in a big flood. No matter how you think dinosaurs left this world, he said it’s important for you to look at all sides of the equation and to try new things. “Having our eyes wide open to alternative explanation is always a good thing in science,” he said. SWAU President Ken Shaw, who’s also a Rotarian, asked Chadwick to discuss how scientists have found blood vessels within dinosaur bones. Since scientists have found these blood vessels, one Rotarian asked Chadwick if the scientific community has aged dinosaur bones incorrectly. He said he believes in creation and the Bible and thinks these bones are only a couple of thousand years old. It’s still important for scientists to look at all sides and to keep asking questions, he said. He said the team at SWAU are working on ways to find DNA within dinosaur bones. Every June, dozens of researchers, teachers, students and other community members from all over the world participate in a dinosaur bone dig in northeastern Wyoming at the Hanson Research Center, which Chadwick started in 1996 with the support of other professors from SWAU, Loma Linda University in California and Southern Adventist University in Tennessee. As they find and dig up the bones, he said they use high resolution GPS equipment to map the bone within the quarry. After they are found and mapped the bones, which are on loan from the Hanson family, are then transported back to the SWAU campus for preparation, curation and research. The museum is on the bottom floor of SWAU’s Scales Science Hall and has over 20,000 bones, interactive displays, skeleton replicas, a 3-D printer, videos and opportunities to observe the preservation process. Scales Science Hall is used for ongoing preservation and research on the bones, as well as enhanced educational opportunities for the Dallas-Fort Worth community. The museum is free and open to the public. School groups are encouraged. Arrangements for tours can be made by calling 817-202-6336. Regular hours are from 10 a.m. to 3 p.m. Tuesdays and Thursdays and 1-5 p.m. Sundays. Visitors are encouraged to park in the Chan Shun Centennial Library parking lot on the corner of Magnolia Street and College Drive, and follow the dinosaur signs to the museum. For more information about the museum, visit dinosaur.swau.edu.